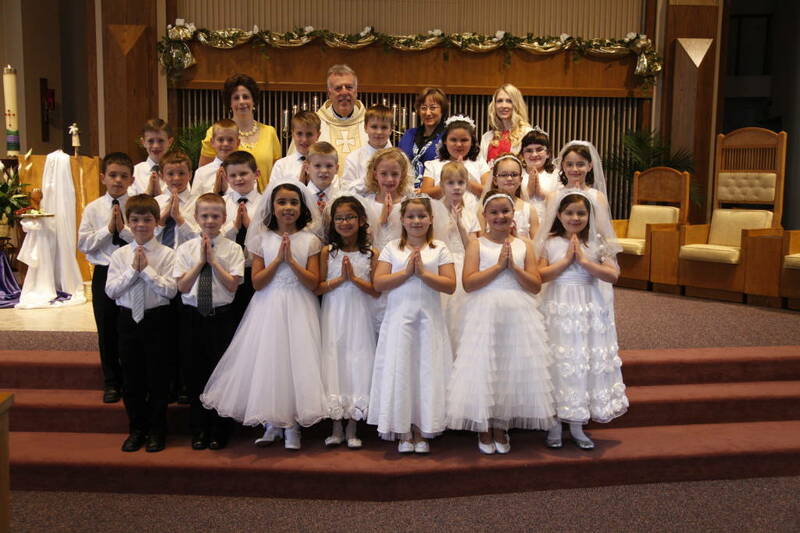 First Reconciliation & First Holy Communion are normally held during a child's second grade year. Children will receive the sacraments in their home parishes or a parish of the parents' choice but the child's theological instruction is generally done through Holy Trinity School, release time, or parent homeschooling. If you child does not attend release time, Holy Trinity, and is not home schooled, then please contact the Director of Religious Education, Joseph H Munning IV at [email protected] or 812-482-3076 ex 304 to make arrangements for your child's education in the sacrament. Parents are always the primary catechists, or religious education teachers, for their children. Our preparation programs exist to help parents prepare their children for the sacraments. By going to Mass every Sunday and on the Holy Days of Obligation, the parents teach their children the importance of worshiping God and of receiving Jesus in the Eucharist. At Holy Family, First Reconciliation is held on a weeknight in early December each year. In addition to the child going to individual confession, the parents are also expected to go to individual confession at that time, to model that behavior for their children. If the parent cannot confess at that time for some reason, they are still encouraged to go to the priest to ask for a prayer or a blessing during the First Reconciliation Service. First Holy Communion is held on the last Sunday of April at the 10:30 a.m. Mass, unless that day happens to be Easter. When Easter is on the last Sunday in April, then First Communion is moved to the following Sunday. Children are eligible to receive their first Holy Communion when they are baptized and at the age of reason. 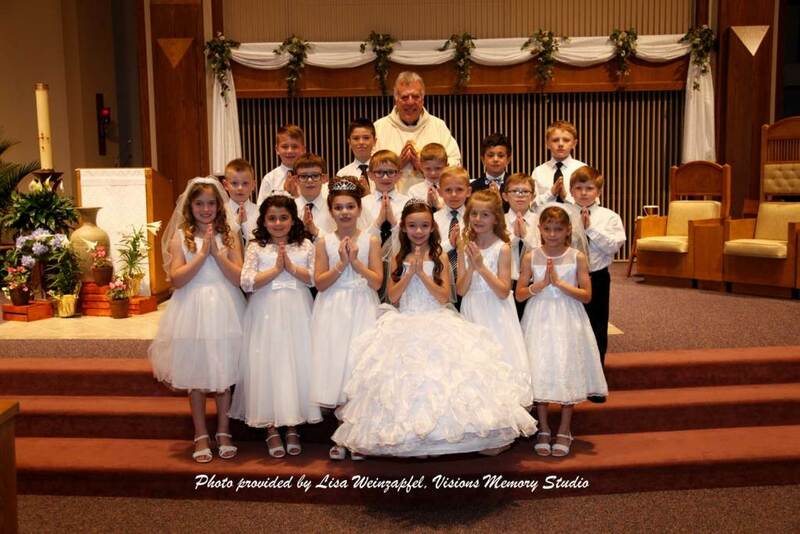 In this diocese, we typically reserve First Communion to second grade students with some exceptions. The children must have received instruction on the sacraments of communion and reconciliation and received their first reconciliation prior to their first communion. If your family cannot attend our first reconciliation service in December, please contact the Parish Office to make an appointment with Father John, or attend a first reconciliation service at another parish. To fill out the registration form available below and submit it the Parish Office or to the director. To schedule an appointment to meet with the director. Appointments can be during work days, evening, or weekends to accommodate your schedule. The appointment is short meeting between the parents and the director. Your child's attendance is welcome but not required. Director of Religious Education, Joseph H Munning IV can be contacted at [email protected] or 812-482-3076 ex 104. To attend the First Communion and First Communion Rehearsal. To attend the First Reconciliation and First Reconciliation Rehearsal, or make an appointment for First Reconciliation with Father John or another parish. To observe the proper attire for students. The dress code is available in the documents below. Photography Order Form Professional photos are available for purchase by Visions Memory Studio. You are welcome to turn in order forms to the director at the preparation sessions. We'd like the forms by April 24.